This reports presents financial data related to lighting installations, before and after retrofit operations. Data are calculated over a large number of years to combine installation costs, maintenance, and energy use. The general principle was to compare the running costs of the “do nothing” approach (keeping the installation as it is and let it die gradually), and the costs associated with a retrofit with highly efficient equipment. For these reasons, long term costs of installation are quite sensitive to the initial cost, and the combined cost of electricity and energy efficiency. Total Cost of Ownership (TCO) of lighting installations has been calculated for various types of buildings: offices, schools, homes and industrial buildings. The data supplied attempt to answer to the following questions: -	Which installations are low hanging fruits (with shortest payback time)? -	For which type of building are retrofit operation more profitable? -	How do various parameters influence the payback time (investment costs, efficacy of luminaires and sources, cost of electricity, etc.)? Then various financial models to initiate successful investments in retrofit operations with generally favourable potentials (like high number of operating hour with good reduction potentials of electric power density) were investigated: -	Direct investment by the user only, showing significant benefits after the payback time. -	Investment by the user based on loans. This extends payback time, but does not require too high of a financial contribution at the beginning. -	Leasing of the entire installation: the building owner does not own the installation. The lighting installation is rented (installation and operation is supplied by a third party). It appears that leasing is nowadays generally the best option is the best way to trigger lighting retrofit to overcome the barriers associated to investment. In this activity, possible actions which could be taken to stimulate the development of lighting retrofit campaigns were identifies, based on the figures from report A.1 “Global economic models” and A.2 “Barriers and Benefits; Building energy regulation and certification”. It was looked into how lighting retrofit benefits are assessed by stakeholders (manufacturers, installers, building managers, etc.). 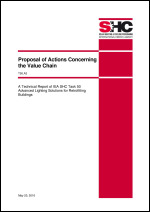 Key strategic actions, or key strategic data to deliver to each stakeholder to possibly trigger a decision concerning lighting retrofit were investigated. The objectives are to identify possible lack of awareness and know-how in the value chain, and to identify strategic information to deliver to stakeholders. Globally, the actions concern accelerating retrofits before the end of existing life of lighting installations: this means that benefits justify an anticipated (before end of gear lifetime) investment.